The best part about our weaving session was that it was a very family friendly activity. Children and adults of all ages could take part in it, and we’d cater according to their capabilities and time constraints. 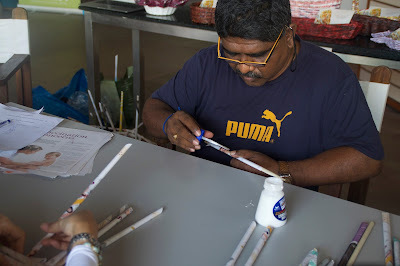 For example, children who were younger and not so sturdy with their hands weren’t left out as Uncle Asok taught them how to make rolls, the foundation of basket weaving. This little team of cousins and their enthusiastic energy was surely a delight to work with! It was pretty funny, but mostly cute, when the two boys kept on asking to learn how to weave a different basket that was on sale when the little girl just kept rolling diligently. Personally, I was delightfully surprised to find children interested in our session. Unlike the usual glue and scissors arts and craft, weaving a basket required much more patience. The 9th of June 2015 marked EnWeave Community’s first group of volunteer’s first day at Club Med. 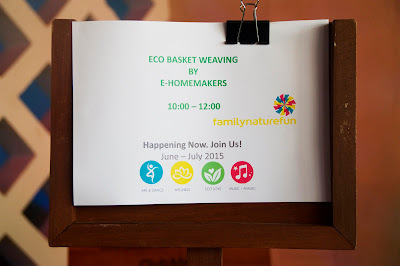 For context and the benefit of you readers, EnWeave was lucky to be a part of Club Med’s Corporate Social Responsibility (CSR) and carry out weaving sessions in conjunction with their Family Nature Fun programme. Aside from raising awareness about upcycling, it was also a good opportunity to promote the art of weaving to Club Med guests. As soon as we arrived Club Med Cherating, Team 1 was greeted by the extremely hospitable staff and especially a man named James, who made sure we were well accommodated. We settled into our rooms in no time as we had help with our luggage and the baskets plus materials we’d brought. One of the first few things that overwhelmed us was the energy everyone had at this resort, always up and going! We knew it was going to be an exciting week ahead.